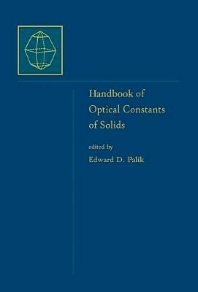 This handbook--a sequel to the widely used Handbook of Optical Constants of Solids--contains critical reviews and tabulated values of indexes of refraction (n) and extinction coefficients (k) for almost 50 materials that were not covered in the original handbook. For each material, the best known n and k values have been carefully tabulated, from the x-ray to millimeter-wave region of the spectrum by expert optical scientists. In addition, the handbook features thirteen introductory chapters that discuss the determination of n and k by various techniques. Physical scientists studying optical properties of solids, especially semiconductors; scientists and engineers doing optical research and development. @qu:"This book will serve as a useful reference. The editor and contributors deserve a measure of thanks for their effort to facilitate for us the finding values of the optical constants of 37 solids and for providing an in-one-placesummary of several techniques for determination of n and k." @source:--R.M.A. Azzam and Jacqueline Casset in APPLIED OPTICS @qu:"The beauty of this book is in the breadth of the spectral range covered....The value of this compilation of critically reviewed optical data far outweighs the books deficiencies and...this handbook must be regarded as a necessity in any physics or materials science reference library." @source:--David M. Roessler, General Motors Research Laboratories, Warren, Michigan, in OPTICAL NEWS @qu:"The editor prepared a table that summarizes the optical properties of the materials reviewed in Volumes. I and II. The amount of the detail that it contains is truly astounding....There is a fundamental reason why a book of this type is much more usefulthan an abbreviated compilation....The book is attractive to workers in many fields because of the vast range of the data." @source:--Philip Baumeister, Coherent Auburn Group, Auburn, California, in OPTICS AND PHOTONICS NEWS @qu:"This book is an essential addition to every scientific reference library and to the bookshelves of all who are interested in what is loosely referred to as 'the optical properties of solids." @source:--B.L. EVANS, University of Reading, U.K.